Cut off from friends, family, and fellowship, British Army Captain John Trotter experiences the loneliness of his isolated outpost as well as a hunger for sharing his Christian faith and praying with other like-minded officers and men. Upon returning to England, Trotter sent letters to a number of officers and other ranks, inviting them to join in organizing an “Army Prayer Union for Officers and Men,” with the hope of engaging in prayer and building strong fellowship in an informal, lay-led setting. It wasn’t until the late 1930s that the seeds of Captain Trotter’s prayer union would make it to America. While aboard a ship bound for Palestine, U.S. Army Lieutenant Colonel Hayes A. Kroner, who had been under deep conviction by the Holy Spirit during the voyage, met a British brigadier who was a member of the British Officers’ Christian Union. Over time, Kroner felt compelled to establish an Officers’ Christian Union in the United States, and in 1939, he returned to the U.S. with the encouragement of the British OCU to start an American OCU. Kroner led a small Washington, D.C.-based Bible study for a few years, and in 1943 he and others formally established the American OCU. In 1972, under the direction of Executive Director Paul Pettijohn, the Officers’ Christian Union was renamed Officers’ Christian Fellowship. However, the purpose of OCF hasn’t changed—OCF exists to glorify God by uniting Christian officers for biblical fellowship and outreach, equipping and encouraging them to minister effectively in the military society. Captain Trotter’s longing for fellowship more than 170 years ago continues to be satisfied through local OCF fellowship groups today. OCF seeks to help Christians in the military society and their families grow together in their relationship with God and others, and to unite them in biblical fellowship and outreach, and encourage each other through prayer. OCF fills this need for biblical fellowship and prayer in five key ways: Prayer, Small Group Local Fellowship and Outreach, Leadership, Conference Center Ministry, and Publications. These Spiritual Pillars express the distinctive characteristics of our Fellowship. They are the “thrust lines” we use to test the appropriateness of all of our programs and actions. They guide us as we seek to act in obedience to our Lord and Savior, Jesus Christ, in all our ministries. He is the cornerstone of OCF, and His Word is the source of these declarations. We believe the Bible is God’s Word written and stress the importance of studying and applying its teachings both individually and corporately. The Scriptures are the authority for our faith and conduct. Since 1943, thousands of individuals have committed their lives to the Lord Jesus Christ through the witness of OCF people, and tens of thousands more have been equipped and encouraged to integrate their faith into their personal, family, and professional relationships and duties. We consider authentic biblical fellowship essential for individual growth and the advancement of God’s Kingdom within the military. This fellowship occurs in many contexts: one-on-one, in small groups, as part of a local conference, or at OCF’s conference centers. As a relational ministry, we believe the inevitable outgrowth of such deep and meaningful fellowship with the Lord Jesus and with one another will be visible, dynamic works of service and witness that glorify Him. We recognize our dependence on the Holy Spirit and are committed to pray. From its inception, OCF has emphasized the importance of praying members and of local fellowships that recognize their dependence upon prayer. OCF people must draw near to God day by day so that His Spirit will provide the qualities of heart, mind, and spirit they need to accomplish His work through them in the armed forces. The biblical principle of “Pray, Discover, and Obey” is central to this process. We are a lay-led movement of Christian officers within the U.S. Armed Forces. The central thrust of OCF is to motivate, equip, and support active duty, reserve component, and retired officers of all branches, and their spouses, to lead dynamic, Christ-centered ministries of outreach and service throughout the armed forces. While we gladly embrace the participation of military chaplains and other ordained individuals, we seek to capitalize upon the unique opportunity God gives to all officers to witness to and spiritually encourage their comrades-in-arms in the military society. The staff is kept relatively small, with a primary focus on motivating, equipping, and supporting the members who are Christ’s ambassadors in military communities. We call Christian officers to integrate biblical standards of excellence into their professional responsibilities. OCF recognizes and affirms the unique responsibilities, expertise, and ethical values of the officer corps. We affirm an officer’s adherence to his oath of commissioning. We believe that devotion to duty is both an appropriate biblical imperative and a means of establishing credibility to speak to other military members about spiritual matters. We are committed to encouraging, supporting, and assisting military families as they implement the biblical principles of marriage and parenthood. The Christian family is the basic worshiping unit of the Church. Military life places unique demands on families even in its routine duties. Field training, TDY, deployments, frequent moves, and the dangers inherent in training and operations amplify this stress. Thus OCF helps husbands and wives grow in their marital relationships, and it helps them as parents to build vibrant, healthy Christian families that glorify God, contribute to increased military readiness, and provide a powerful witness within the military. We are committed to the spiritual development of each person in our movement by helping him or her in ways that find expression in godly service and outreach to the military. OCF communicates about opportunities for personal ministry to its members, to their family members, and also to other believers in the military society. And OCF teaches, equips, encourages and supports members and their families in such ministries. We seek to support and encourage chaplains. Local or ship-based chapel activities offer prime venues for Christ-centered outreach and service to a military community. OCF acknowledges the chaplain’s responsibility for and authority in local Command Religious Programs. Thus we support chapel-sponsored and workplace ministry activities through prayer, encouragement, and participation. By cooperating with and assisting chaplains and lay leaders, we seek to exalt the Lord Jesus Christ throughout the entire military society. 1. Centering on Scripture. We believe the Bible is God’s Word written and stress the importance of studying and applying its teachings both individually and corporately. The Scriptures are the authority for our faith and conduct. Since 1943, thousands of individuals have committed their lives to the Lord Jesus Christ through the witness of OCF people, and tens of thousands more have been equipped and encouraged to integrate their faith into their personal, family, and professional relationships and duties. 2. Uniting for Fellowship. We consider authentic biblical fellowship essential for individual growth and the advancement of God’s Kingdom within the military. This fellowship occurs in many contexts: one-on-one, in small groups, as part of a local conference, or at OCF’s conference centers. As a relational ministry, we believe the inevitable outgrowth of such deep and meaningful fellowship with the Lord Jesus and with one another will be visible, dynamic works of service and witness that glorify Him. 3. Engaging in Prayer. We recognize our dependence on the Holy Spirit and are committed to pray. From its inception, OCF has emphasized the importance of praying members and of local fellowships that recognize their dependence upon prayer. OCF people must draw near to God day by day so that His Spirit will provide the qualities of heart, mind, and spirit they need to accomplish His work through them in the armed forces. The biblical principle of “Pray, Discover, and Obey” is central to this process. 4. Lay-led. 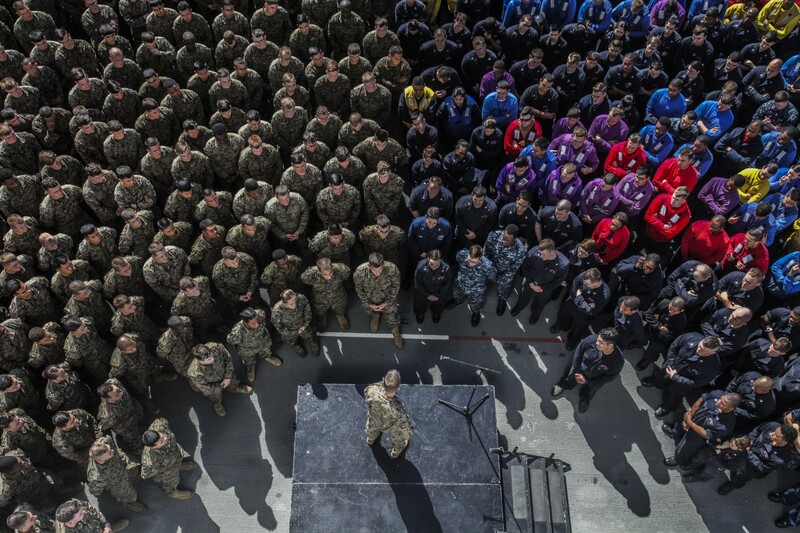 We are a lay-led movement of Christian officers within the U.S. Armed Forces. The central thrust of OCF is to motivate, equip, and support active duty, reserve component, and retired officers of all branches, and their spouses, to lead dynamic, Christ-centered ministries of outreach and service throughout the armed forces. While we gladly embrace the participation of military chaplains and other ordained individuals, we seek to capitalize upon the unique opportunity God gives to all officers to witness to and spiritually encourage their comrades-in-arms in the military society. The staff is kept relatively small, with a primary focus on motivating, equipping, and supporting the members who are Christ’s ambassadors in military communities. 5. Integrating Faith and Profession. We call Christian officers to integrate biblical standards of excellence into their professional responsibilities. OCF recognizes and affirms the unique responsibilities, expertise, and ethical values of the officer corps. We affirm an officer’s adherence to his oath of commissioning. We believe that devotion to duty is both an appropriate biblical imperative and a means of establishing credibility to speak to other military members about spiritual matters. 6. Nurturing the Family. We are committed to encouraging, supporting, and assisting military families as they implement the biblical principles of marriage and parenthood. The Christian family is the basic worshiping unit of the Church. Military life places unique demands on families even in its routine duties. Field training, TDY, deployments, frequent moves, and the dangers inherent in training and operations amplify this stress. Thus OCF helps husbands and wives grow in their marital relationships, and it helps them as parents to build vibrant, healthy Christian families that glorify God, contribute to increased military readiness, and provide a powerful witness within the military. 7. Equipping to Serve. We are committed to the spiritual development of each person in our movement by helping him or her in ways that find expression in godly service and outreach to the military. OCF communicates about opportunities for personal ministry to its members, to their family members, and also to other believers in the military society. And OCF teaches, equips, encourages and supports members and their families in such ministries. 8. Supporting the Chaplaincy. We seek to support and encourage chaplains. Local or ship-based chapel activities offer prime venues for Christ-centered outreach and service to a military community. OCF acknowledges the chaplain’s responsibility for and authority in local Command Religious Programs. Thus we support chapel-sponsored and workplace ministry activities through prayer, encouragement, and participation. By cooperating with and assisting chaplains and lay leaders, we seek to exalt the Lord Jesus Christ throughout the entire military society.